When you are looking for an apartment, knowing how much you can spend monthly for your rent and living expenses is crucial. First-time renters often make the mistake of having a number in mind for their rent but forget to include the other monthly costs of leasing an apartment. The rent itself is only the beginning. You also need to take utilities and other expenses into consideration. While some apartments include utilities in the rent, this is rare. Depending on where you are renting, the utilities can cost as much or more than the rent for an apartment. Be sure to ask any potential landlord what typical monthly utility costs run. Some landlords provide copies of recent electric, water and other bills so you can see how much you need to budget each month. The cost of utilities is impacted by your own use of the utilities, whether you use electronics a lot, the weather and other factors. When you are looking for an apartment, the size and layout are important factors, but having a good idea of utility costs in the area can help you create a realistic budget. The cost of electricity is a huge variable when budgeting for an apartment. If you live in a hot climate and plan on running the air conditioning all summer long, your electricity costs will jump up in the summer months and drop in the winter, so budget accordingly. If you use a lot of electronic gadgets and appliances, their use has an impact on your monthly electric expenses. If the heat is electric rather than natural gas, this also affects how much you are paying. Over the course of a year, a typical electric bill for a two-bedroom apartment is around $75 per month. Natural gas is the second most popular way to heat an apartment, so you need to budget for this as well. Gas heat is slightly less expensive than electric heat. In the winter months your bills are higher, so take the weather in your area into account. A two-bedroom apartment with gas heating has a typical gas bill of approximately $60 a month. Do not forget to check the oven and stove – are they electric or gas? How much do you cook? Fuel oil is not as common a utility as gas or electric, but some apartments do use it. Be sure to confirm whether this is what is used for heating, hot water and other needs, as fuel oil is generally more expensive than natural gas. For a two-bedroom apartment, the cost of fuel oil runs about 60 percent higher than the cost of natural gas. Cable and internet service are usually bundled into one fee these days, but you may discover your apartment complex includes these in your rent since the cost remains the same no matter how much or how little you use it. Be sure to ask the landlord or manager. If it is not included, look into how much it costs and budget accordingly. Water is almost always included in the rent but be sure to check your lease to see if this is true. In the rare instance where you have a separate water bill, you can ask for the per gallon cost of water or find it on a recent water bill. The typical person uses about 90 gallons of water a day or 2,700 gallons a month. Multiply this by the number of people in the apartment, then by the water rate. While you almost always have to pay separate utilities when renting an apartment, you may also have to pay additional monthly fees to the apartment complex you should include in your budget. Signing a lease now and finding out later you forgot to include even a few of these in your rental budget could lead to problems. Always ask for an accounting of all fees up front before signing. If you have a pet, especially if it is a dog or cat, your landlord may charge a flat monthly fee on top of your rent. This covers any damage your pet might cause and the cost of cleaning your apartment when you move out. Many landlords now charge a monthly pet fee rather than a one-time deposit. Sometimes they charge both. Sometimes this is included in your rent, sometimes it is not. Ask the landlord or apartment manager. In most cases you have to use the garbage pickup service chosen by the apartment complex. Ask if there is a garbage fee and how much it is, if so. If parking is available, you may need to pay an additional amount for your parking spot or access to the parking garage. The same goes for any storage units or a storage locker. Depending on what part of the country you are in and how much storage is provided, these fees can range widely. Parking in some cities where parking is at a premium can cost almost as much as rent. You do not have to have renter’s insurance to protect the contents of your apartment, but it is a good idea. 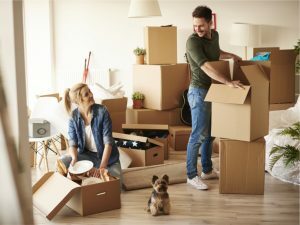 If your furniture, electronics, jewelry or other valuables are stolen or damaged in a fire or other natural disaster, renter’s insurance covers it. Your landlord is not responsible for the contents of your apartment in most cases, so having your own insurance protects you against loss. Some landlords now require proof of renter’s insurance before they allow you to move in. There are also numerous one-time fees you should keep in mind if you are renting an apartment. While these are not monthly expenses, you need to have the money to pay for them before signing a lease and moving into a new apartment. A security deposit, usually equal to at least one month’s rent. A pet deposit, generally between $100 to $300. Utility deposits, the amount depends on each utility company’s policy and your credit score.